After receiving a lot of customer requests to design a Larger Catch Can, we are excited to offer the new E2 – Elite’s 2nd Generation Catch Can. For more information on the Clean-Side Oil Separator, click here. In addition, your E2 C7 Kit will come with (2) Exit Port Check Valves , the 2nd Exit fitting will be installed into the factory Intake Coupler upstream of the Throttle Body. This will give evacuation at Wide Open Throttle (WOT) when there is no vacuum present in the intake manifold to maintain evacuation, very important. This will be your COMPLETE PCV Oil Ingestion Solution. Do it once, and do it right! Elite Engineering Catch Can: Often Imitated, but never Duplicated! Please check out our instructions to get a better idea of the installation requirements. ** Our Check Valves are integrated internally to our EXIT Hose Barb Fittings; (This design is currently Patent Pending). The PCV (Positive Crankcase Ventilation) system is designed to regulate and remove fumes from the engine crankcase, and to alleviate crankcase pressure which could cause oil leaks or seal damage. The PCV system routes crankcase fumes into the intake manifold where they can be burned to eliminate harmful emissions into the atmosphere. The PCV valve controls the amount of crankcase flow volume depending on the engine's load. With large throttle openings (high engine loads), the more blow-by gases are produced, and the more the PCV system flows oil vapor in to the intake manifold. A small amount of that ignited mixture leaks past the piston rings and ends up in the crakcase. This leakage is often reffered to a "blow-by" or leakage past the pistons. Some of the oil mist and other products settle along the engine intake and over time form a "gunk". Our oil catch can collects the oil mist and condensed the fuel vapors while allowing "cleaner" gasses to pass back into the intake manifold. Many Corvette owners can testify to the amount of oil residue that can accumulate inside the intake manifold, throttle body, intake track and even the air filter during aggressive driving conditions. Throttle body and/or MAFS (Mass Air Flow Sensor) malfunction or failure. Reduced octane of the air/fuel mixture, which can cause detonation and the ECM (Engine Control Module) to retard timing, thereby reducing engine power. Excessive carbon build-up on valves, piston crowns, combustion chambers and spark plugs. This also increases the chance of detonation and power loss. Increased emissions & possible contamination of catalytic converters and oxygen sensors. Bottom line: Excessive amounts of oil vapor in the intake manifold is detrimental to your engine! Solution: Install theElite Engineering PCV Oil Catch Can! 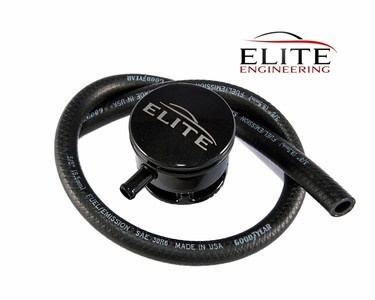 Elite Engineering's PCV Oil Catch Can has a unique 3-chamber design to effectively separate oil from the crankcase vapors, thereby eliminating all negative effects of excessive intake system oil contamination. 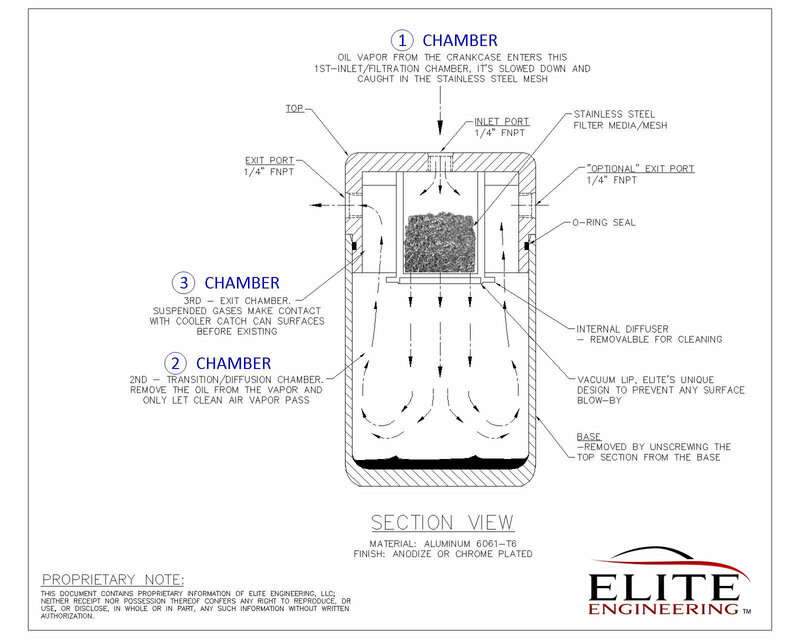 Oil vapor from the crankcase enters the 1st - Inlet/Filtration chamber where it is slowed down and caught in the stainless steel mesh, it then moves onto the 2nd - Transition/Diffusion chamber. The Diffusion chamber has a very specific set of holes to remove the oil and only let clean air vapor pass. Lastly, the vapor passes into the 3rd - Exit Chamber before it exits the Catch Can. Not all Catch Cans are created equally! Often imitated, never duplicated. Most Catch Cans on the market are just comprised of an empty container with 2 ports. While that simple design may trap a few oil droplets, our Catch Can is designed to condense the oil vapor and trap the oil inside the container. Our test proven design incorporates a stainless steel mesh and screening mechanism that acts like a maze to collect and condense the oil vapor. Once the oil vapors condense into liquid droplets, it falls to the bottom of the can. In addition, the top assembly is specially designed to keep any liquid from climbing out the exit hole during aggressive driving conditions. Stored oil volume is approximately 11 ounces. You will be amazed by how much oil our Catch Can will catch! Don't settle for an inferior competitor's product. Insist on Elite Engineering's Catch Can! The E2 PCV Oil Catch Can is constructed of the finest materials inside and out. High performance car owners insist on the best products that offer unsurpassed function as well as impressive visual enhancement. Our Catch Can does both! Our exclusive design incorporates optimum function and the finest materials, construction and finish for maximum dependability. Machined from billet 6061-T6 aluminum alloy, and then anodized in a variety of colors for a striking look. The internal condensing/filteration screen is stainless steel encased inside an aluminum alloy housing designed for low flow restriction. The housing can be disassembled for screen inspection, cleaning or replacement if needed. The inlet and outlet hose fittings are brass, and threaded into the body and sealed with Teflon tape. Supplied hoses are fuel and oil vapor compatible (SAE 30R7 rated). The bottom catch can reservoir screws onto the top of the unit, and is sealed with a built in O-ring. Inspection and cleaning is easy by simply removing the bottom of the unit without disturbing the mounting system or hoses. In keeping with our high quality standards, all supplied mounting hardware and screws are stainless steel. The supplied custom machined mounting bracket is black anodized 6061-T6 aluminum, and is attached to your specific vehicle with the hardware supplied. Each Catch Can kit includes everything you need to install the system. Basic mechanical skills and common hand tools are the only things required. Catch Can assembly beautifully anodized in BLACK, complete with 3/8" barbed inlet/outlet hose fittings. 3/8" ID fuel and oil vapor compatible hose. Black zinc plated hose clamps.